Saginaw Bay, on the GLEAM map. 1 — The Saginaw Bay area could see an influx of funding for habitat restoration and other environmental improvements. The Sustain Our Great Lakes program, a public-private partnership, is accepting applications for funding through its 2013 grant cycle. Delisting of habitat-related Beneficial Use Impairments. Beneficial Use Impairments refer to Areas of Concern in the Great Lakes, which include the Saginaw River and Bay. To apply for funding, projects must occur within the Great Lakes basin. Eligible applicants include nonprofits, educational institutions, and local governments. Up to $9 million is expected to be available for Sustain Our Great Lakes awards, with individual awards ranging from $25,000 to $1.5 million. – Request for proposals (pdf). 2 — Saginaw Bay is red on a new map of environmental stressors in the Great Lakes. The map comes from the GLEAM project, which stands for Great Lakes Environmental Assessment and Mapping. The map, three years in the making, identifies environmental stressors from Minnesota to Ontario, according to University of Michigan researchers. The project’s lead researcher says the condition of the Great Lakes continues to be degraded by stressors including coastal development, pollutants transported by rivers from agricultural and urban land, fishing pressure, climate change, invasive species, and toxic chemicals. 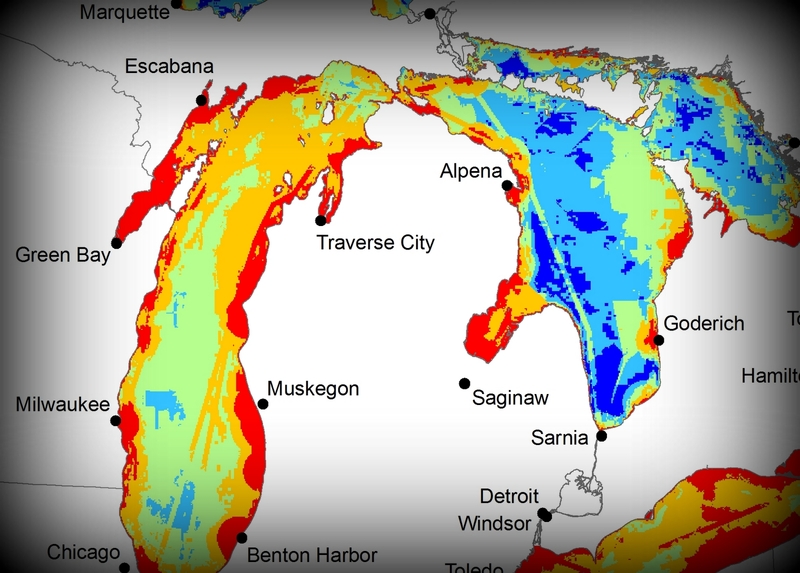 “Large sub-regions of moderate to high cumulative stress were found in lakes Erie and Ontario as well as in Saginaw and Green bays, and along Lake Michigan’s shorelines. In contrast, extensive offshore areas of lakes Superior and Huron, where the coasts are less populated and developed, experience relatively low stress,” researchers say. The map is designed to be used by federal and regional officials to sustainably manage the Great Lakes.